Lifetime Products, National Public Seating, and Correll all manufacture adjustable tables. These different manufacturers use a couple of different design options. These different design options provide uses for different needs. We will explore these options here. Lifetime Products has a traditional pushpin design. Simply engage the pin triggers on either side of the table legs and either pull up or push down on the table top to change the leg lengths. When the tabletop height can be locked in, the push pins will pop out in a locked mechanism. National Public Seating uses a similar mechanism. Simply engage the push pins and slide the legs longer or shorter as needed. Correll, inc. uses a screw-locking mechanism to change the height of many of their adjustable tables. This design is a little more cumbersome than simple push pins; however, their mechanism allows for a larger quantity of height settings. For instance, the Lifetime and National Public Seating design typically provide 3 height settings ranging from 22 inches and 36 inches. The Correll design has 11 settings ranging from 22 inches to 32 inches in 1-inch increments. Thus, both designs have their advantages and disadvantages. 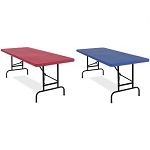 Lifetime folding tables model 80161 features adjustable-height legs and a 4-foot x 2-foot almond-colored table top. The table top height can be adjusted to 22 inches, 29 inches, and 36 inches. Order your Lifetime adjustable-height tables here. Lifetime 22920 6 ft Tall Folding Height Adjustable Table Base with a 72 in x 30 in Almond Molded Top, 1.125 in Round Bronze Hammer Tone Frame. NPS Color Height Adjustable Leg Table - Folding 6 Ft Resin Table. Adjusts in 1 In increments and smooth enough for writing. CFA2448M Correll 4 Foot Adjustable Folding Wooden Table with a 48x24 inch Melamine Top and Steel Folding Frame. Order your Correll folding tables here. Correll RA2448 R-Series adjustable-height folding table. 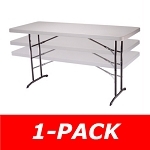 This 24 x 48 inch table adjusts in height from 22 inches to 32 inches in 1-inch increments. This table comes in mocha granite or gray granite. My family has Lifetime tables. Although I have never used the Adjustable Leg Table, I think it sounds nice. It would be especially nice to be able to adjust the height of the table based on the occupants and what the table is being used for, especially to me, because I am relatively short, and when we play games on a table it can be difficult for me sometimes. From the article, it seems really easy to lock in and adjust. I would really like one of these tables!